...where you just can't win?" 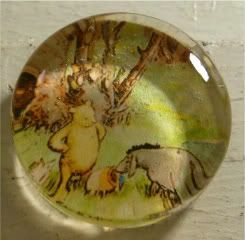 Another Lovely Day Designs magnet...that I totally bought in anticipation of Winnie the Pooh. Although it seems to me that if any of Pooh's friends had just given him some huney when he asked for it at the beginning of the (really less than) 63-minute movie, there would have been no need for the movie at all. The poor guy - all he had was a rumbly in his tummy, and off he and his pals went on a very important adventure. A supercute, felt longer than 63 minutes, adventure. While I hated the deliberate misspellings running rampant, I was most charmed by the interaction of all the characters and the actual book text. Watching Pooh and Eeyore and the rest of the bunch wrapping themselves around letters, or jumping on top of them, or pulling whole paragraphs across the page? Love. I haven't a clue if they do that in the book, though. I know, I know. I should be shot for never actually having read Winnie the Pooh.